Welding-Art is the page where Welding Artists are welcome to display the products of their own work. We are happy and proud be able to present some of the artistic Creations of those of our Readers who use their knowledge and craft to make pleasant works expressing their personal Vision. We thank them for the privilege of letting us show here their works. Readers are invited to use the Invitation Form further down the page, to send to Welding-Art notes, information, comments and critics, to announce their or others' expositions of Art products made by welding and, sure enough, Photos of their Masterpieces. 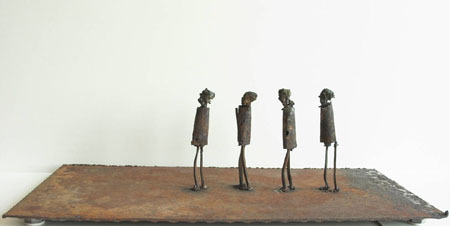 Welding-Art shows the Works of Art of Contributors in the Gallery to fellow Artists and to Readers at large. It can become a meeting place where to make new friends, where to find new ideas, where to become stimulated by examples, where to find will and encouragement to try something new, or to finish that longtime overdue project. 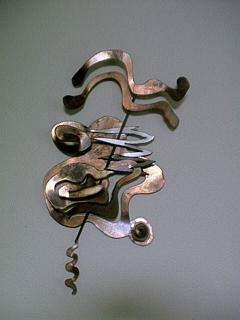 Welding-Art is the site where the best fruits of your artistic toil are displayed. A new page on Architectural Metalwork was recently added to our website. Johan Jonsson was born in Luleå, Sweden in 1966. Except for a few years in Stockholm and Gothenburg he has worked and studied in Luleå. He now divides his time between Luleå and a little village outside Skellefteå, where his studio is located. Johan writes, sculpts and uses multimedia for his works. Ten years ago the writing was the main focus, now it’s more of a complement to his visual art, even though there’s an ongoing, lifelong, project [The Romanticizer] that is partly based on writing. I have over 30 years experience with the commercial construction industry as a general contractor and I am also AWS certified. My welding services include:In-shop/On-site Structural, Pre-Fab, Repair, I work also per contract within the oilfield industry repairing/installing crude oil/gas pipelines, pump jacks,and field equipment installation. I also offer one-of-a-kind commissioned metal art work/sculpture witin the mediums of Stainless Steel, Brass, Copper, Iron, Steel. I accept art work commissions by private contract. In this space a Form was appearing, asking for contributions from readers wishing to show their artwork. Since this offer is now unavailable, the relevant Form has been removed.